Neurofunctional acupuncture (or contemporary medical acupuncture) is a precise peripheral nerve stimulation technique designed to promote self-regulation of the nervous system. 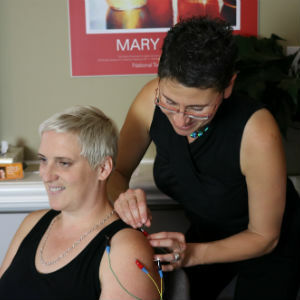 Using thin acupuncture needles, electrical stimulation is painlessly used to heighten the function of the nerves that control specific muscles, blood vessels and other nerves. Through the action of this gentle contact, immune and endocrine system performance is also improved, and treatment can often result in a permanent resolution of an ongoing problem. How Does This Approach Differ from Traditional Acupuncture? The neurofunctional approach differs in that the main goal is not to simply “balance the body’s energy”, but to optimize function of the nerves, muscles, blood vessels, immune system & endocrine function. It also doesn’t focus on the direct elimination of physical discomfort, but rather in improving the bodily processes that are necessary to good health and pain-free living. We find that it’s a valuable resource, in conjunction with chiropractic care, in maximizing full health potential. For some, it can take up to 48 hours for the body to re-integrate the neurological changes that have occurred during a session. Treatment “turns on” muscles and nerves whose function has broken down. When they all come back “online” for the first time, it’s not uncommon to feel like you’ve just completed a really good workout. Dr. Metz has been helping people through this state-of-the-art technique since 2002. She’s had years of experience in placing tens of thousands of needles, and has additionally earned Advanced Neurofunctional Sports Performance certification from McMaster University. You’ll be in good hands with our advanced acupuncture techniques. Our care is safe and gentle, and we can help you with everything from sports performance to greater freedom of movement.